I just spent an unforgettable week in Oxford, England, whisked away by the articulate pen of Carolyn Weber. It’s no easy task to hold my attention captive for 450 pages, but this book did just that. In her memoir, Surprised by Oxford, Weber invites the reader to journey with her through her conversion story in the mid-1990s among the world’s academic elite. 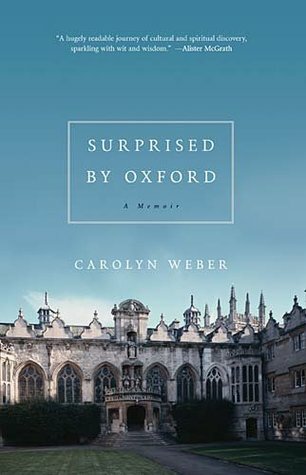 By organizing her book according to Oxford’s three academic terms, and describing the historical town in rich detail (stomping grounds for the likes of Lewis, Tyndale, Latimer and Ridley), Weber creates a portal to the past, making it easy to walk in her footsteps and feel the forcible nature of God’s goodness in her story. But as the book progresses, its pages feel less and less dark, then less mottled, and by the final chapters there is exhilarating light and joy. But despite her friends’ authentic faith, Weber describes her antagonistic spirit towards them. She made it anything but easy for them to pursue her, to continue dialoging about the good news. But underneath her prickles, behind all of her acidic arguments, was a steel-trap heart being undone. Try as she might, Weber couldn’t dismiss her Christian friends’ joy (“no one else has it in such abundance”), couldn’t shake their good news, couldn’t stop the rising tide of Grace. Ever wistful and compelling—told as only a literature professor can tell—Weber’s story is a striking reminder that Christ’s message is for our world today in all of its antagonism and plurality and chaos. The message cannot be unheard, so it needs to be told. If you are praying for an unbeliever in your life, if you are asking God for greater courage to share His good news with those around you—this book is for you. If you are agnostic or atheistic or cannot fathom how academia and faith can be inextricably bound up together—this book is for you. If you need to remember the beauty of the good news, need to revisit “the love you had at first” (Revelation 2:4)—this book is for you.